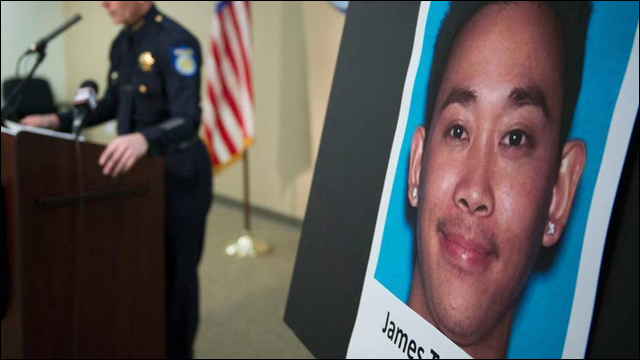 28-year-old James Tran is charged with attempted murder. In Sacramento, police have arrested a suspect in connection with the stabbing of Spencer Stone, the U.S. Air Force Airman who was hailed as a hero for helping to thwart a terrorist attack on a train in France. 28-year-old James Tran was arrested on suspicion of stabbing Stone multiple times outside a nightclub in midtown Sacramento last month. The fight, which was caught on a surveillance camera, was apparently sparked by some kind of dispute between Tran's and Stone's friends over a cell phone video. Leading up to the stabbing, there was an argument between two groups involving Stone and Tran over video that was recorded. The situation de-escalated, but Tran re-engaged Stone, and there was a fist fight, according to Somers. "People like to use cell phones and try to catch people in different situations," Somers said. "There was people in one party that videotaped somebody else and it wasn’t something that was appreciated," Somers said. During the fight, Tran circled around Stone and stabbed him multiple times in the back. Tran then left the area, Somers said. Stone suffered a punctured heart, liver and lung and later had open-heart surgery. Tran, who has a prior criminal record, is charged with attempted murder. The investigation is continuing, but no charges have been filed against anyone else involved. According to police, it doesn't appear that Tran or anyone in his group were aware of Stone's public stature.